Since the introduction in 1953, "Musui pot" is a popular simple decoration-free pot made of aluminum alloy casting, and has been manufactured for more than 50 years. 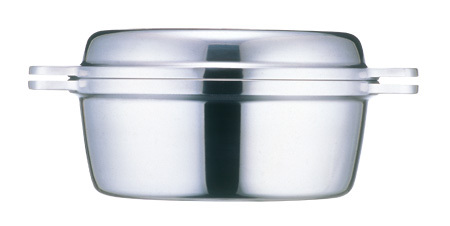 It has a "thickness" that cannot be seen in normal products, and the same can be said for the lid. One can feel the quality of "a product that lasts for a lifetime" in his/her hands. From the historic point of view, it can be said that it is a basic yet complete form of a cooking equipment that adapted to the food culture of the post-war Japan. The simple shape and the robust structure radiates a positive feeling, and surprises one with its completeness as a tool that pursues quality and functionality. Being a product from some 57 years ago, it is still being used regularly. Some of them are being passed on in the family for three generations. In fact, the more one uses it, the more he/she can feel its existence and affection, and it allows the user to experience what it is like to "use a good product for a long time". In present days when the focus is on eco-design and sustainable design, more great things can be expected as a product that serves as an indicator of what a product design should be. By "being used continually", the completeness of the product will be more refined.